Allegedly. I’ll come to that in a minute. I’m not going to go into the rubbish about SEO other than to say if they’re link building this way how do I know they’re not doing all sorts of black hat SEO that’s going to get them blacklisted as a bad neighbourhood and do me more harm than good. 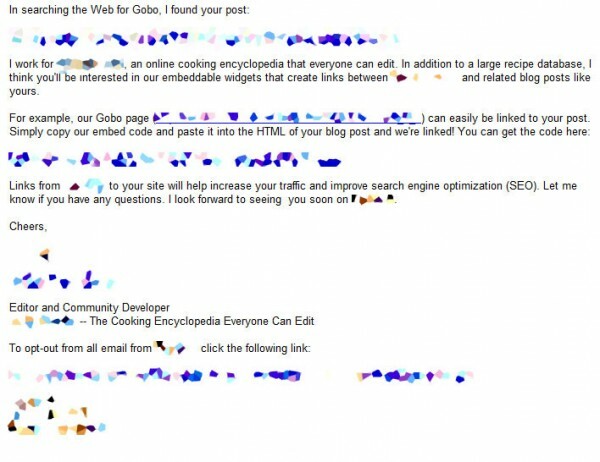 In this case the bot found some of my recipes and some of my stuff about gobos and decided that there was a chance that there was some sort of long tail search that it could optimize for. Given the money being mentioned for some of that kind of automatically written content it’s no wonder that companies are trying to get in on the act. This one though takes the biscuit. Or as the American’s might say the cookie. Cookies are made with Cookie Cutters which is a term sometimes confused with gobos although strictly speaking cookies and gobos are not the same thing which is why I think the bot may have made its blind leap of machine logic. What I find funny is the idea that they would include gobos in a recipe database. Gobos. Pieces of glass that are etched or otherwise treated so as to project images or patters from lights. I can’t help thinking they would be a little bit chewy and might cause some indigestion. Not quite as funny as Monty Python’s Albatros or Crunchy frog but not too far away. Anyway it amused me but I’ve not explained the Edible Underwear connection.